Politics, news, current events. Something I'd like to share with the world. Ahram-Online -CAIRO: Activists have set Monday, which marks Sinai Liberation Day, for protests against the recent government announcement that it was acknowledging Saudi ownership of two Red Sea islands under Egyptian control. Egypt's military said on Sunday that it is deploying forces to secure major public buildings on Monday, which has been set by activists as a date for protests over the recent Saudi island deal. The army said in a statement that its forces will be deployed around “vital targets and major institutions,” adding that security patrols and military police forces will be stationed in major areas nationwide. A government decision this month to cede control to Saudi Arabia of the Red Sea islands of Tiran and Sanafir, near South Sinai, sparked protests on 15 April, with thousands of demonstrators protesting near Cairo's press syndicate. The protests, believed to be the largest demonstrations since President Abdel-Fattah El-Sisi took office in 2014, saw the arrest of dozens of people, many of whom were released later in the day. The island deal has not yet been approved by parliament. Monday marks Sinai Liberation Day, when Egypt regained control over the Sinai Peninsula in 1982 after years of Israeli occupation. The army has posted several photos of queues of military vehicles in the streets as well as forces at what appeared to be a military base. 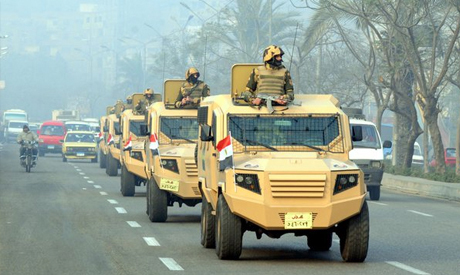 The army added that its air and naval forces will take part in celebrations marking Sinai Liberation Day, with performances planned across the country's governorates. Military ensembles will put on musical performances of patriotic pieces. Egypt’s acknowledgement of Saudi sovereignty over the Red Sea islands has sparked widespread public outcry, with some critics accusing President El-Sisi of "selling" the islands. Egyptian and Saudi officials say the islands belong to the Gulf kingdom and were only under Egyptian control because Riyadh had asked Cairo in 1950 to protect them. Egypt's interior ministry has warned ahead of Monday's planned protests that it would show no tolerance for attempts to “undermine the country's security,” urging people not to respond to "calls inciting chaos."